Why is Information Technology so Dominating ? Computer Systems Engineer from Sir Syed University Of Engineering & Technology.I am passionate about all types of programming. 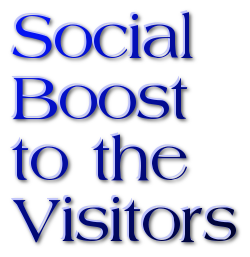 Why all of us think most of the time about the metas and why not about Social Ways To Boost The Visitors? Look at Facebook, Twitter, Google+ ,Stumble Upon etc.They are famous by the publicity among the masses.Now for you to get yourself publically visible to others,the best and the most effective way is to create the publicity in these communities.Get them informed about your website/blog.Tweet them,pin them,+ them or like them whenever they post something there.Share your new articles there.If you give them importance then they will also show some interest in your work or refer others to visit your site.Take a weekend reserved to do these sort of tasks.I will show you how to familiarize yourself with others in a completely different and effective way with some illustrations.